This publication aims to increase levels of understanding, raise awareness, and heighten levels of protection afforded to inter-war pubs. The project reflects the high level of threat now faced by England’s pubs, and the high rates of closure, alteration and demolition. 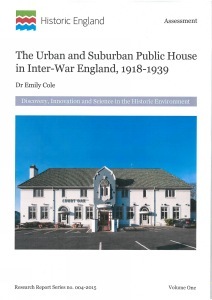 The report outlines the background and methodology of the project, and sets out a summary of the historical development of pubs in the inter-war period; for instance, notable architects, architectural styles employed, active breweries, and the ideals of pub improvement. Buildings considered include ‘improved’ or ‘reformed’ pubs – which usually featured rooms for entertainment, dining and non-alcoholic refreshment – as well as pubs built on more traditional lines. The second part of the report contains detailed summaries of 37 pubs which were selected for detailed investigation, and which have been considered worthy of consideration for statutory designation. The third part comprises the appendices – six separate tables of pubs considered at various stages of the project.